Vern Burkhardt (VB): You say research reported in The Economist indicates that "almost 60 percent of companies are not able to generate sufficient innovative ideas." Do these tend to be the companies that are failing financially? Gijs van Wulfen: In the end they are. The world turns faster and faster, and according to Arthur D. Little, an American consulting firm, the speed of the product life cycle increased by a factor of 4 over the last 15 years. This means you have to keep innovating your product portfolio and likely at an ever faster pace. If you stop innovating for too long you will end up failing financially. And if you are failing financially it's too late to innovate because getting an innovation from ideation to the market takes between 18 and 36 months. This means you have to start innovating before you start having financial problems. VB: Do you think the pace of innovation will continue to increase exponentially in the future? Gijs van Wulfen: Yes, that is my expectation. Every market on every continent is getting ever more transparent. With social media we can now know everything from everybody in real time so this increases the pressure for innovation. It's increasing the spread of ideas around the world, and that pace will accelerate ever more in the future. Even old, traditional product groups with the longest life cycles are accelerating in their pace of innovation. Medicine is an example. Everybody has to keep up the pace. VB: Is this because of rapid advancement in technology? Gijs van Wulfen: Yes, but this phenomenon also applies to innovation in services. Innovation used to be primarily in products, but more and more the services sector is discovering innovation. They are borrowing a lot of expertise from the products innovation world. That's why there are many recent books about service design – even in former public services areas like the health sector. In Europe we have huge challenges because our population is getting older and needing more medical care. Customized medical care is increasing costs enormously, and it is all paid with public money. This sector needs a lot of innovation. We now hear of things like self-medication and exponential increases in the use of sophisticated technology. We are also seeing enormous innovation trends in many other service areas. VB: An aging population has a lot of ramifications related to affordability. Gijs van Wulfen: Yes it does. In Europe the group of people who are working and paying for health care is getting smaller, while the aging group that needs these services is getting larger. It is a big paradigm shift with many ramifications. VB: You identify 10 innovation inhibitors most managers face. How can they overcome these inhibitors, such as a lack of real customer insights? Gijs van Wulfen: Becoming aware of the lack of knowledge about customer insights is the first step, of course. When managers do become aware innovation becomes relevant, because new young calves outrun the old cash cows in the competitive marketplace. Every company has their old cash cows and they assume it's a great cash cow, but suddenly some new young calf from the competition comes along. People cross their own borders only when they have to. Companies are no different. I don't believe in the idea of a continuously innovative company – it's a dream and I don't think they exist. When you innovate you implement a new idea, and if it results in a big success you start to rely on it. Only when you see the growth rate of this new innovation in products or services declining do you say, "Hmm we're going to need another innovation." Innovation always goes in cycles, and as companies we only go over our known borders when we have to. VB: What is the FORTH innovation method? Gijs van Wulfen: The elevator pitch – FORTH is a customer-oriented, inspiring innovation method for creating many new business cases with an internal team that you can use for innovation of products, services, or business models. That's the essence of it. VB: FORTH is a methodology that people can follow? Gijs van Wulfen: Yes, it's a methodology made for the front-end of innovation. On the one hand it's a highly structured method, but on the other it provides enough space for people to be creative. Every phase has divergence – generation of many ideas – followed by a convergence phase where the best innovative concepts are described as mini business cases. Prior to FORTH there weren't any real methods for front-end innovation other than the more technical ones like TRIZ, the simplified TRIZ known as SIT, or the Israeli version called ASIT. TRIZ starts with a problem or product and applies the 40 principles of TRIZ as a source of inspiration for new product ideas. The essence of FORTH also has to do with my background. Originally I started as a marketeer, so my approach is outside in rather than inside out. I start with "Observe and Learn" – learn how to know your market and learn about customer frictions. Find out what the relevant customer frictions are, look for solutions to them, then make them into new concepts. VB: Does this mean the underlying principle behind FORTH is meeting the needs of customers? Gijs van Wulfen: Yes, but customers don't know what they need. If you asked a customer at the beginning of the 20th Century, "What do you want?" they would have asked for a faster horse. They couldn't ask for a car because the car wasn't invented. You would have had to found out what the customer really meant by a faster horse, which would have been "I want to move faster." The necessary solution was not a faster horse, the most obvious answer. The innovative challenge would have been to answer the question, how can we move things faster beyond use of a horse? You have to find out from the customer what his friction is – what he really wants, what he can't achieve today, what his challenge is. And then you have to provide him with a solution to his challenge. VB: Does the FORTH method work equally well in manufacturing and service sectors? Gijs van Wulfen: Yes, it works for products and services. When I look back over the last five years I conclude that in a western society like the Netherlands, ¾ of FORTH users are service companies and ¼ are product companies. It reflects the split in the total number of product compared to service companies. Similarly, in Canada and the U.S. ¾ of the people work in service companies. Product companies often have an R&D funnel like the Robert Cooper innovation funnel. They start with a technological invention and in the innovation funnel they try to develop it into a product customers really need. Only when they are incompetent in terms of generating new innovations do they think, "Maybe we should start from a different perspective. Maybe we should start outside-in instead of inside-out." Most service companies, such as publishers, public health companies, or insurance companies, don't have R&D Departments. As a result, when they face innovation challenges, they have limited internal innovation experience or capacity so they ask themselves, "How are we going to do it?" This is why a lot of service companies have adopted FORTH. It offers a perfectly structured start to innovation. In product companies FORTH needs to replace the normal R&D paradigm, but in service companies you can make a fresh start. It is easier for me to get FORTH started in a service company than in a company with an internal R&D department. In most services companies there are not internal vested interests, people who think their job is devoted to innovation. VB: Would you talk about the role of organizational strategy in the FORTH method, and how it can guide the drafting of mini business cases based on the best ideas identified by the innovation teams? Gijs van Wulfen: The interesting thing is that clients say to me, "We have an organizational strategy, and innovation is mentioned in it." The written strategy says they need to innovate but that is where it stops. There is no focus. The strategy doesn't identify where the company needs to innovate, or why it needs to do so. What are the company's expectations with respect to innovation? Many companies' strategies say, "We need to innovate" or "We are an innovative company." But they don't have a process for innovation. This is why I start the FORTH process in a company by helping them make a concrete innovation assignment. I get an audience with top management, preferably key executives including the CEO, and we try to translate strategy into a clear innovation focus with smart and clear expectations. Of course I want to have the project leaders of the innovation assignment at these discussions so that they fully understand the nuances of, and expectations for, the assignment. In the innovation assignment, as you see in the examples in the book, there are some smart criteria to which the mini new business cases have to comply. It might say, for example, that we expect a minimum turnover per mini new business case of 25 billion Euros two years after introduction, a 25% profit margin, a product that is producible in our own facilities and that fits in with the company's strategy. A concrete assignment results in a connection between strategy and innovation focus. VB: Has it been your experience that most CEOs are able to define innovative challenges for their companies? Gijs van Wulfen: Some need a little help, I say a bit ironically. But CEOs are capable people and usually understand their business and its expectations. VB: How does that work? How do you give them a little help? Gijs van Wulfen: It's very simple – everything I do is in the book. I get the CEO and the innovation product leader together in a room with me. I have a flip chart with questions on it. "Why do we need to innovate? What do we want? For whom do we want it? Where do we need to innovate? And which criteria do we use to evaluate ideas?" I give them blank Post-it notes and say, "Write everything you would like to see happen related to innovation in your company." They write what comes to mind on their post-it notes and put them on a flipchart. One participant sits to my left, the other to my right, and I type the innovation assignment that arises from their Post-it notes into my computer. It's as simple as that. Why do I follow this approach? My experience is that verbal discussion doesn't result in a lot nor does it often lead to final conclusions. VB: There's something about having these ideas visual? Gijs van Wulfen: When you write it down on Post-it notes, and there are no comments about what you have written, you keep on writing. If the CEO were to say out loud, "I want to go left" and his innovation project leader is in the room, the innovation project leader is going to say, "Oh yes, sure. Left is best." But if the innovation project leader doesn't hear the CEO say this, he might write down "I want to go right," and then you can have a real discussion. Especially in Western companies CEO's like to be the top monkey on the rock. Many feel they need to know it all, and they can't lose face. They can't say, "I don't know where we have to go!" That's why I help them – I call it facilitating. I don't call it consulting. I help them set some real directions, such as we need to innovate because the market isn't growing, we are stuck at 40% market share, or we need to go into other markets. I don't know the answer but I work with the CEOs to help them define an innovation focus. Should we go into business-to-business or business-to-consumer? What are the timeframes? I help them by asking questions and building a strategy, by helping them make their innovation questions intelligent and relevant. VB: You are helping them think? Gijs van Wulfen: Yes. I ask them the awkward questions they most often don't ask themselves. It is not that they don't have the ability to do so. Usually they're too busy dealing with fires and other pressures. VB: How can you ensure the FORTH team is composed of ideal members? Gijs van Wulfen: You actually don't know. One thing I know for certain is that you have to connect everybody who is in the innovation funnel. Normally, marketing will brief R&D, and R&D will brief production, the buying department, and IT. The ideal team is composed of members from every stakeholder group in the company, typically marketing, R&D, sales and service, IT, production, and central support. Also, if you're innovating for three continents you have to have the Sales Directors from the three continents involved. You have to find the experts who are relevant to the assignment and will adequately represent their stakeholder group. You also have to connect the decision makers at the meeting where your team presents its mini new business cases. This is often the Board of Directors but most definitely includes the CEO. Often the CFO needs to be involved in the review process because probably some investments are needed. I look for people to be on the FORTH team who are innovative, willing or able, and enthusiastic, but I also sometimes include someone who is fairly skeptical. Why the skeptic? There are always some skeptical people in your company. When one of them is on the team, becomes really enthusiastic, and at the end of the presentation of the mini business cases is cheering and saying, "Yes, we've got to do this!" everybody thinks, "Wow. What's happened to him?" VB: If he's convinced it must be good. Gijs van Wulfen: It must be good. Imagine you own a pub, and there are a lot of fights between people who drink too much. If you put the biggest fighter on the serving side of the bar, you'll have a quiet pub without fights. This is why I often also take one of the fighters in the company to be on the team. This doesn't help me facilitate the FORTH method, or give me a lot of pleasure, but the end result is usually great, which is a different kind of pleasure. I look for the expert, but I also consider who I need on the team to get acceptance for the new concepts in the company. This is a most difficult task. The hardest thing isn't thinking up great concepts for clients with frictions. Often the biggest challenge is how to get acceptance of these concepts within the company. VB: Why do you think attaining acceptance is so challenging? Gijs van Wulfen: People don't like change. It's a normal reaction. They view change as frightening. Some in the company think, 'Ok we're going to innovate, we're going to work with other partners, the new products are going to be produced in another plant because we can't make it, and I'm losing my power'. They are afraid of losing power and ultimately their jobs. If you want to make a good impression on a prospective new employer, you should say in your job interview, "I'm a real change agent. I love and welcome change." But no one does. Consider your own habits. How long have you subscribed to the same newspaper? VB: If you were to identify the key factor in a successful innovation process would it be having an excellent 'ideation' process? Gijs van Wulfen: With FORTH you can jump-start innovation based on the concrete mini new business cases, but equally important is the innovation delivery phase in which you have to make it happen. Both are equally important because without the right ideas the delivery phase is worthless. On the other hand, if you only ideate and generate fantastic ideas but can't deliver on them, it doesn't give you anything. The key factor for a great ideation process is finding relevant customer frictions. That's key. You have to find something which is really troubling your customers' minds. If you were the CEO of a company I'm working with, I would ask you, "What's on your board meeting agenda Monday morning? What are the issues?" If I can solve one of these issues, then I have an entry and can make a great contribution. VB: Would you talk more about the concept of customer frictions? Gijs van Wulfen: It's rather a new concept, is it? A lot of people talk about customer needs but I call them frictions because people don't like friction. Friction is something that also gives energy. It's something you want to get rid of, something that bothers your mind. It's the difference between what you want and what you can get. It's one of the things that cause you to lie awake at night. A customer friction is what you should be looking for when focusing on innovation in your company. VB: Could it be an anxiety because you don't know what you want? Gijs van Wulfen: Yes, it could. You often find frictions not by what people say but by extrapolating from a conversation with them. It's somewhat like what is called an "unmet need," though I think the word need is too nice. I associate a need with a wish whereas what we're looking for is more urgent than a wish. That's why I call it a friction. VB: Is knowing about a customer's friction comparable to understanding what he is trying to accomplish? Gijs van Wulfen: Yes, but it's what he can't manage or do by himself. As a business-to-consumer or business-to-business company you're helping the next customer in the value chain realize his goals and challenges. That's what you have to look for, from the point of view of the customer. VB: "An [innovation] opportunity can be anything. I usually define it pragmatically as a theme, topic, technology, trend, area or target group which provides the best opportunities to realize the innovation assignment." Would you talk about this? Gijs van Wulfen: The second phase for FORTH is Observe and Learn. The innovation opportunities are used as a way of discovering what's going on in the world, what's going on in the marketplace. As the phase title indicates, we dedicate ourselves full time to observing and learning. In Raise Ideas, the third phase, we have a two-day new product brainstorming session often with up to 14 participants, all of whom are on the Innovation Team. We start differently. Based on the inspirations they gathered during the Observe and Learn phase everyone works in silence writing down their ideas for new products, services or business models on Post-it notes – it's a brain dump. I usually start with the "outsiders" who have been invited to participate – people not employed by the company. They may be a customer or supplier. During the brain dump more than 50 opportunities might be identified. We select the best 8 to start our innovation expedition – to get inspired. The opportunities could be a new target group, a theme or a trend. It's like standing in the middle of a room and saying, "Ok we've got to start innovating. Where do we start looking?" The group brainstorm generates the most attractive inspirations from the Observe and Learn stage. The selected ideas are read out loud, which leads to other ideas from the group, which are written down and, in turn, these lead to even more ideas. At the end of the 2-day process it's not unusual to have more than 500 crazy new ideas hanging on the wall – the ideas wall. Ideas are grouped into idea directions, and mind maps are produced, during this divergence process, for the ideas with the most potential. During the convergence process the group will identify 3, 4, or 5 innovation opportunities with the most potential, those that address the most significant customer frictions. If the group gets stuck for ideas we introduce one of the many brainstorming techniques developed by various practitioners over the years. I've included a description of them in Appendix II of my book. VB: Do most new products or services start with an idea that 'comes out of nowhere'? Gijs van Wulfen: I think an idea never comes out of nowhere. You get new ideas only if you're open to them or are in search of them. Probably most often the search is occurring unconsciously. You are confronted with a certain trigger and the trigger makes you have an idea. If you weren't subconsciously looking for an idea you wouldn't get the brilliant 'aha moment'. Sometimes people call it 'serendipity', but serendipity only exists because in your subconscious you were looking for something. If you look at all the great examples of innovation that suddenly happened, the main thing in common was that they were all in search of something. With coca-cola they were in search of medicine and found coca-cola. With Viagra they were looking for blood pressure medicine and found Viagra. The real story in almost all serendipity examples is that people started searching for something. You only get ideas when you feel a need somewhere in your belly, and subconsciously you are aware that you need something different. VB: Why are customer frictions "probably the most effective sources of inspiration when it comes to inventing new product ideas?" Gijs van Wulfen: They play a key role in the ideation process. A friction is an undiscovered need or a wish from a specific target group which is not sufficiently satisfied. You can think up all kinds of new products but if they don't fill some need they're worthless, which is why you should start with finding the needs, and then you can look for the answers. VB: What can be learned from ex-customers, non-customers, and critical buyers during the Observe and Learn stage of the FORTH method? Gijs van Wulfen: Their views on their needs and their opinions about present solutions often reveal unresolved customer frictions or frustrations. That's why they stopped using the product or service, or it may be why they have never used it at all. They are often also what Eric A. von Hippel calls 'lead buyers'. They buy a product and then change it because it isn't exactly what they need. Von Hippel gives the example of how the dirt bike was developed by off road riders because their need was not being satisfied. The lead buyer concept also applies to critical innovative buyers who you should look for because they are probably innovating your product by changing it. They're doing this because they need something that isn't in the marketplace yet. VB: Is the 'brain dump' during the generation of product or service ideas the most important source of innovative ideas during the Raise Ideas phase of the FORTH method? Gijs van Wulfen: A 'brain dump' is nothing more than writing down ideas that are triggered by some stimuli, as we discussed earlier. 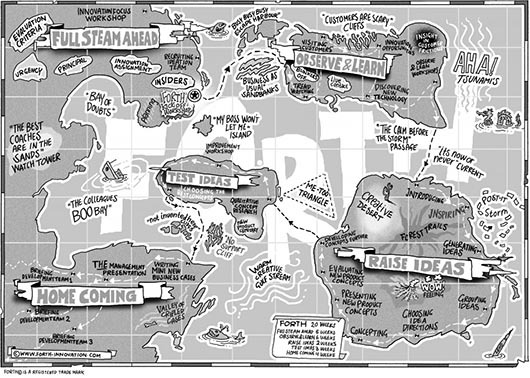 After every idea trigger you can have a 'brain dump'. The 'brain dump' gets the group into really innovative thinking. Starting a brainstorming session with a spontaneous 'brain dump' empties your mind of the ideas you have been considering for the innovation challenge, with the result that you are better able to generate new ideas when exposed to idea triggers. The most interesting and productive 'brain dump' is often when one is exposed to the most relevant customer frictions. The 'brain dump' approach is a great way to get people thinking outside the box. During the series of brainstorms you are exposed to idea triggers which go further and further away from your normal paradigms, and each time you go back to the original innovation challenge to reinforce the underlying purpose of the assignment. That's how you take people outside the box in their ideation process. You start with the most obvious observations about customers' needs and then ask which customer frictions suggest the most opportunities. Then you have idea triggers which are much more extreme and take the team further outside the boxes in their minds. VB: You say that trends and technological developments can also be a source of inspiration for new product or service ideas. Would you talk about this? Gijs van Wulfen: The most important thing is to get inspired from different directions because that results in different new innovative ideas. For example, last month I was brainstorming a new concept for a public health organization. We took 16 trends in health, society, and digital media because we had 16 participants in the brainstorming session. Every person represented one trend and we did a 'trend dance.' In the Netherlands we have a 'chair dance' where you have 10 people but only 9 chairs, and each time the music is stopped another chair is removed. Whoever is without a chair is eliminated from the competition. VB: Right, in North America we call it musical chairs. Gijs van Wulfen: Yes, and when the music stops someone doesn't have a chair. We had 16 people with 16 trends, and they generated ideas from their own trends after the music started playing. When the music stopped playing they had to find someone with another trend. The pairs of people would tell each other about their trends, and then build new ideas related to both trends. When the music re-started the people would start running again – they don't walk as in musical chairs. When the music stops the participants had to meet in groups of three and generate ideas. And then there would be four trends in the next round. This approach works for technological developments or trends, and the random combination of developments or trends results in people getting outside the box ideas. In Observe and Learn you may have identified 5 key customer frictions, and if the group has identified 5 significant technological trends, you can have an ideation technique in which technological trends are matched with customer frictions to see what ideas come to mind. How can we solve this friction with trend 1, with trend 2, with trend 3 and so on? This approach brings a whole other kind of perspective to the brainstorm. VB: Is this done in the Observe and Learn Phase? Gijs van Wulfen: You discover the developments or the trends in the Observe and Learn phase, and you apply them in the Raise Idea Phase. VB: You refer to 'the forest trails in your mind'. What are these? Gijs van Wulfen: You have your usual thinking patterns and these links in your mind get thicker and stronger. Consider your normal patterns as highways in your mind. In order to find new ideas it's essential to open your mind to new information, to be exposed to other triggers, and to go off the highway and discover new forest trails. You have to do that consciously; otherwise, subconsciously you will always travel over your thinking highways. You need to discover new forest trails. Speed up the development of a new product. Spend a greater part of their effort on product development projects which will lead to successful new products. Create a positive influence in the organization. Increase the chance that the product development program will meet the objectives of the organization. We need to devote more energy to generating creative new ideas for revolutionary products and services. We need to discover new forest trails. Gijs van Wulfen's FORTH method provides us with an approach for systematically and creatively generating breakthrough products and services ideas. 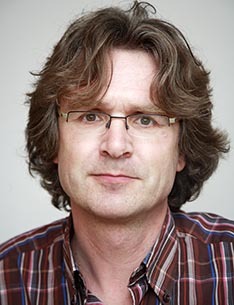 Gijs van Wulfen is an ideation facilitator and founder of the FORTH innovation method ("VOORT innovatiemethode"). He helps companies and organisations worldwide to jump start innovation. In 14 weeks he facilitates an internal innovation team on their FORTH innovation journey from which they will return with 3-5 mini new business cases. His clients are industrial and services companies and non-profit organisations. His dream is to make the FORTH innovation method the most used innovation tool in the world.